Spelling & punctuation will appear exactly as you entered it on your order, so if you want an apostrophe "s" to a name, you must add it. If you need more then 18 characters, please contact us. Please note, the more characters you request, the smaller the text will be. For this line enter an established year (Eg. 2012), a City and State (EG. Austin, TX), a declaration about your favorite team (Eg. EAGLES HEADQUARTERS) or other line of text. The text in this line does come in uppercase letters, similar in style to the way "EST" is shown in the example. Spelling and punctuation will appear exactly as you enter it on your order. If you need more then 25 characters, please contact us. Please note, the more characters you request, the smaller the text will be. Yes, the name & year I entered are correct. 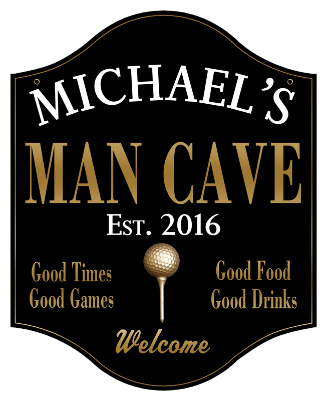 Ideal for your favorite golfer, this Personalized Man Cave Sign Golf 2 - Metal comes with your name and second line of text. Ideas for the second line of text could be the year you established your Man Cave, the city and state for your Man Cave, a favorite saying or even a declaration about your favorite team (Eg. 19th Hole Beer Stop). Our Exclusive Design since 2010. Durable and attractive, this Personalized Man Cave Sign is 14.5 in. x 18 in., has a black background and has a long lasting finish. It is drilled and riveted for easy hanging. Proudly hand made in the USA, is just under 2 lbs and made of heavy 20-gauge American steel. Therefore, this is NOT a flimsy sign or cheap thin faux composite wood or plastic sign. * Please note - this particular sign design was previously made of wood and the beer mug was made of resin. It is now a flat handmade American 20 gauge steel sign.